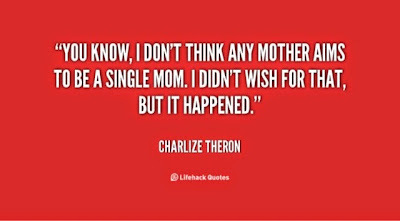 This quote by Charlize Theron says it best. I never wished to be a single mom, but that is what I have been for 21 years and I have to say, it was the best years of my life. My mother got divorced from my father when I was 9 years old and she became a single mom. Having her as an example was the best lesson I could draw from to be the best mom to my boys to this day. It made me want to be better and sacrifice what I needed to, to give my sons the best time and life I could, so that I could see them thrive better than I did in these conditions. This was my time to prove that not only I could do that, but love in a selfless place and put others needs before my own and grow me to the woman I am today. I am currently able to inspire a generation that would at least want to look at my example and feel that despite the dreams I have had as a little girl, the dream to give my boys what I didn't have manifested because giving to them was like giving to myself and it did pay off. I have two sons in college and a third in high school preparing his life for college as well. Sometimes I question if I did enough, gave them enough and was man enough to fulfill both of the roles I took on? The answer is yes!! It's amazing that my love has grown even deeper as they got older. I really love the people they actually are. The reflection that I get back from them is love. When you get that effortlessly, you did succeed and they will stop at nothing to continue to love you, sacrifice and do all those things you did for them in return to make you proud of them. Love is truly a natural gift that keeps giving and my boys have returned that love 10 fold to me. For that, I am so happy and know that if I can do it all again, I absolutely would because the payoff for my decision since my first son, has been the greatest accomplishment in my life and I get to live and share it with any woman out there that is trying to find her rhythm in being a single mom. I have mastered it and I am proud to say I did it 3 times and you can too. I will be doing a series of inspirational and motivational blogs called , Mama Lo Knows. Oprah has said that being a mom is the hardest and most challenging position she never signed up to be and admires those that have taken that role and have made it their career to be the best at it. In am that mother and I am happy to say, I succeeded. Now that my kids are older, I can now concentrate on the things that I set out to do before becoming a mother. Is it too late? If my mind believes that, then it is, but since I don't believe that, then it isn't. My next chapter in Lolo Knows just began. I am so excited about the abundance of opportunities that are flowing my way. The only person that can hold me back from them is me. I have a reference through being a mom and how I drove three boys in the direction of education and success. Well all I have to do is take all of that direction and give it to myself. It's that simple. We may tend to over analyze our own purpose because as a single mom, our focus was to our children, but sit back and try doing what I am doing. Dream and imagine again and then just take necessary steps to fulfill that desire. If your kids aren't as grown as mine, do it now to prepare your life for that time when they get older, that way, you're not trying to figure it out then. Get a head start!! It's ok. Just do it because time flies and at least when it comes, you will know what to do.